Eliminate potential race conditions between the MongoDB data Docker container and the Node.js web-application container in a ‘Dockerized’ MEAN application. Docker has also gained enormous popularity. According to Docker, Docker is an open platform, which enables developers and sysadmins apps to be quickly assembled from components. ‘Dockerized’ apps are completely portable and can run anywhere. Using Docker, we can ‘Dockerize’ or containerize each tier of a MEAN application, mirroring the physical architecture we would deploy a MEAN application to, in a Production environment. 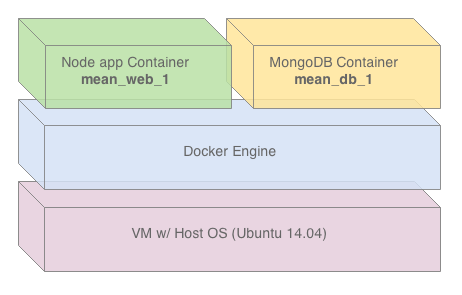 Just as we would always run a separate database server or servers for MongoDB, we can isolate MongoDB into a Docker container. Likewise, we can isolate the Node.js web server, along with the rest of the components (Mongoose, Express, Passport) on the application and presentation tiers, into a Docker container. We can easily add more containers, for more functionality, such as load-balancing and reverse-proxies (nginx), and caching (Redis and Memcached). The MEAN.JS project has been very progressive in implementing Docker, to offer a more realistic environment for development and testing. An additional tool that the MEAN.JS project has implemented, to automate the creation of multiple Docker containers, is Fig. The tool, Fig, provides quick, automated creation of multiple, linked Docker containers. Using Docker and Fig, a Developer can pull down ready-made base containers from Docker Hub, configure the containers as part of a multi-tier application environment, deploy our MEAN application components to the containers, and start the applications, all with a short list of commands. Note, I said development and test, not production. To extend Docker and Fig to production, you can use tools such as Flocker. Flocker, by ClusterHQ, can scale the single-host Fig environment to multiple containers on multiple machines (hosts). Docker containers have a very fast start-up time, compared to other technologies, such as VMs (virtual machines). However, based on their contents, containers take varying amounts of time to fully start-up. In most multi-tier applications, there is a required start-up sequence for components (tiers, servers, applications). For example, in a database-driven application, like a MEAN application, you should make sure the MongoDB database server is up and running, before starting the application. Although this is obvious, it becomes harder to guarantee the order in which components will start-up, when you leverage an asynchronous, automated, continuous delivery solution like Docker with Fig. When component dependencies are not met because another container is not fully started, we can refer to this as race condition. I have found with most multi-container MEAN application, the slower starting MongoDB data container prevents the quicker-starting Node.js web-application container from properly starting the MEAN application. In other words, the application crashes. In order to eliminate race conditions, we need to script our start-up sequence to guarantee the order in which components will start, ensuring the overall application starts correctly. Specifically in this post, we will eliminate the potential race condition between the MongoDB data container (db_1) and the Node.js web-application container (web_1). At the same time, we will fix a small error with the existing MEAN.JS project, that prevents proper start-up of the ‘dockerized’ container MEAN.JS application. 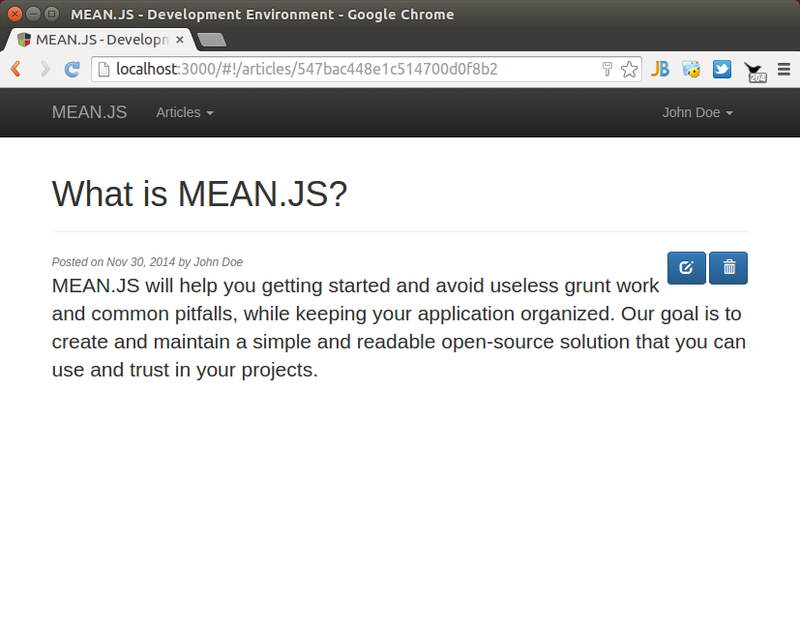 Clone the meanjs/mean repository, and install npm and bower packages. 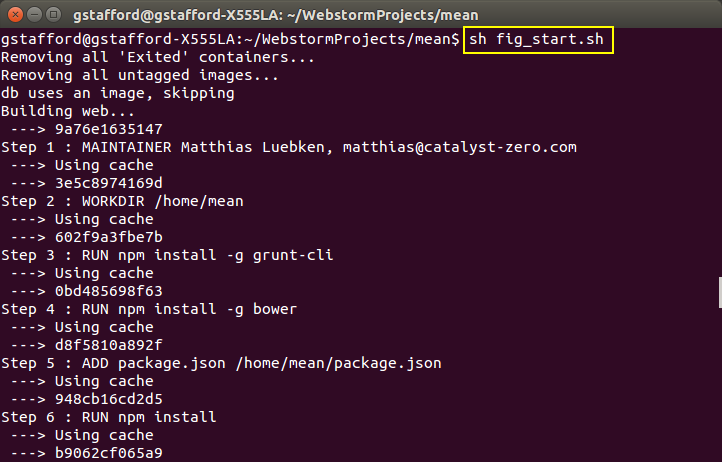 Add fig_start.sh start-up script to root of mean project. 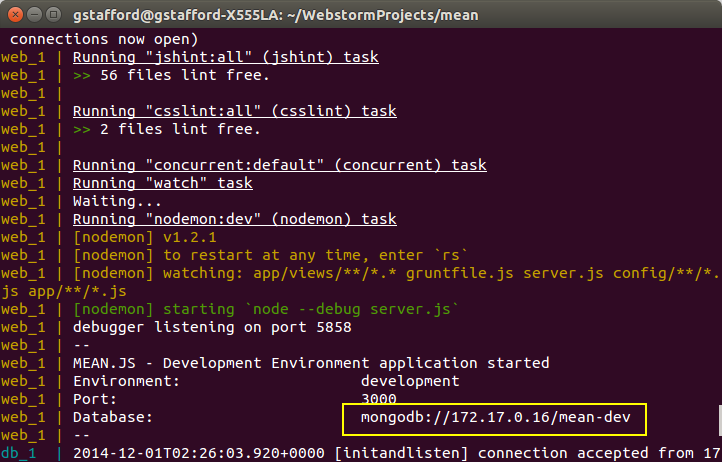 Optional, add wait_mongo_start.sh clean-up script to root of mean project. 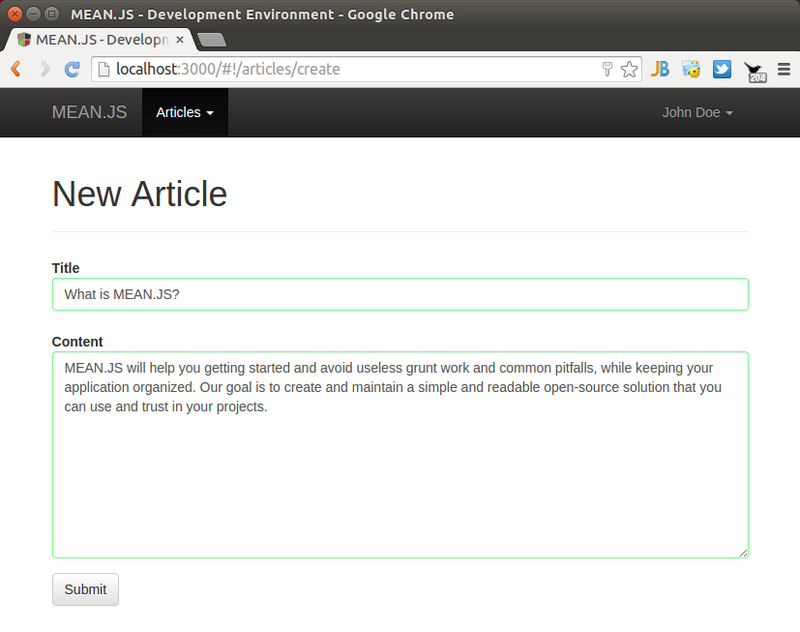 The existing MEAN.JS application references localhost in the development configuration (config/env/development.js). The development configuration is the one used by the MEAN.JS application, at start-up. 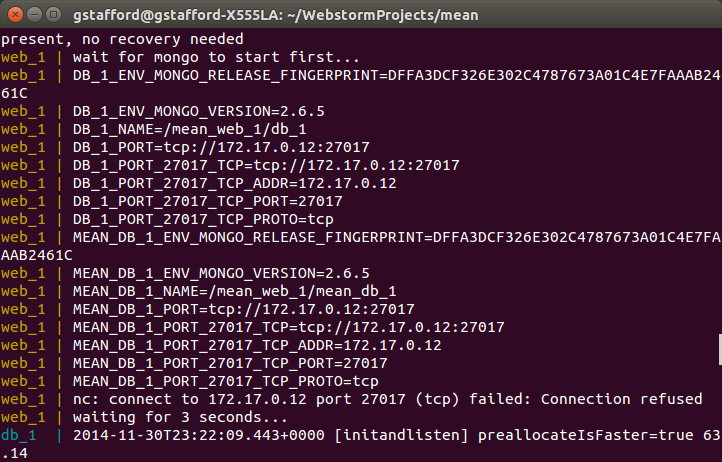 The MongoDB data container (db_1) is not running on localhost, it is running on a IP address, assigned my Docker. To discover the IP address, we must reference an environment variable (DB_1_PORT_27017_TCP_ADDR), created by Docker, within the Node.js web-application container (web_1). Start the application using Fig commands or using the clean-up/start-up script (sh fig_start.sh). 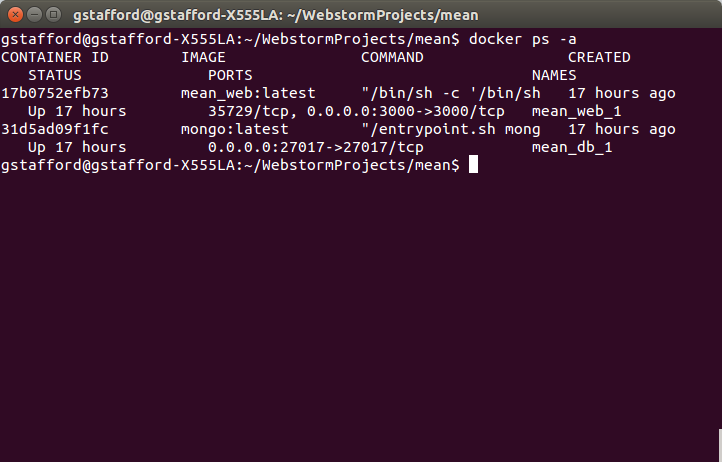 The CMD command is the last step in the Dockerfile.The CMD command sets the wait_mongo_start.sh script to execute in the Node.js web-application container (web_1) when the container starts. 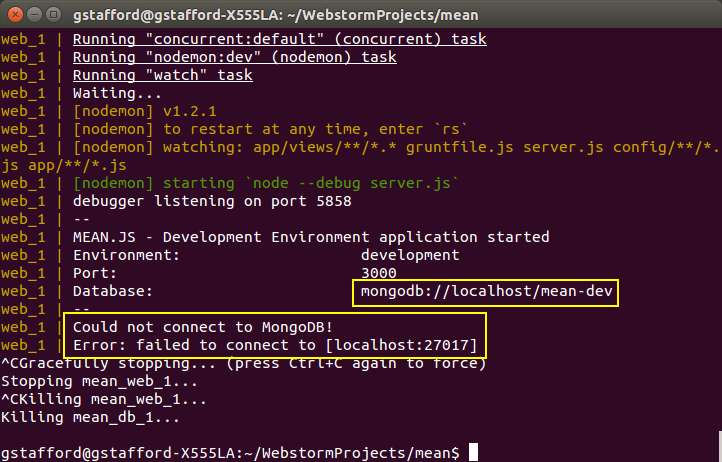 This script prevents the grunt command from running, until nc (or netcat) succeeds at connecting to the IP address and port of mongod, the primary daemon process for the MongoDB system, on the MongoDB data container (db_1). The script uses a 3-second polling interval, which can be modified if necessary. 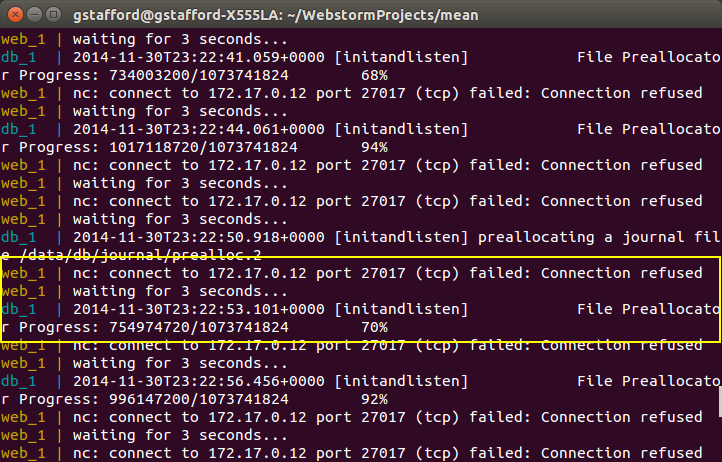 echo "wait for mongo to start first..."
echo "waiting for $polling_interval seconds..."
The environment variables referenced in the script are created in the Node.js web-application container (web_1), automatically, by Docker. They are shown in the screen grab, below. You can discover these variables by uncommenting the env | grep DB_1 | sort line, above. The Dockerfile modification is highlighted below. # Manually trigger bower. Why doesn't this work via npm install? The config/env/development.js modifications are highlighted below (abridged code). The fig_start.sh file is optional and not part of the solution for the race condition. Instead of repeating multiple commands, I prefer running a single script, which can execute the commands, consistently. Note, commands in this script remove ALL ‘Exited’ containers and untagged (<none>) images. echo "Removing all 'Exited' containers..."
echo "Removing all untagged images..."
Below are screen grabs showing the MEAN.JS application starting up, both before and after the changes were implemented. This entry was posted on November 30, 2014, 11:04 pm and is filed under Bash Scripting, Build Automation, Client-Side Development, DevOps, Enterprise Software Development, Software Development. You can follow any responses to this entry through RSS 2.0. You can leave a response, or trackback from your own site.